AUSTIN – On July 7, Gov. 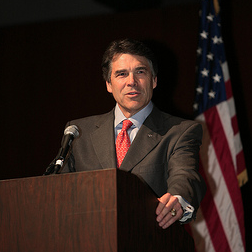 Rick Perry directed the activation of state search and rescue capabilities, including Texas Military Forces and Texas Task Force 1 (TTF-1) personnel and resources, as heavy rains and flooding continue to threaten the Rio Grande Valley. Heavy rains from Hurricane Alex have caused flooding of the Rio Grande into neighboring communities. The National Weather Service predicts increased rainfall in South Texas over the next 48 hours, which will exacerbate the already flooded conditions in the area. 10 Texas Military Forces high profile vehicles and 30 guardsmen in Laredo. 2 Texas Military Forces UH-60 Blackhawk helicopters and 16 guardsmen in San Antonio. TTF1 rescue swimmers in Laredo. Additional TTF1 personnel are on standby for deployment as needed. Additionally, the Texas Department of Transportation is coordinating road closures in the affected areas as necessary. For more information about road closures, please visit http://www.dot.state.tx.us/travel/road_conditions.htm. The State Operations Center remains at an increased readiness level and continues to work with the National Weather Service to monitor the storm system.